Speedplay is showcasing a gallery of high resolution photographs on its web site of the step-by-step, re-creation of a vintage 1961 Faliero Masi Special racing bicycle. The painstaking bicycle construction project was commissioned by Speedplay pedal designer, Richard Bryne, to replicate his own original, 46 year-old Faliero Masi Special. 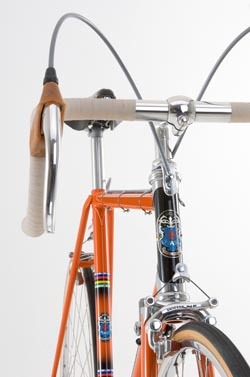 Faliero Masi-built bicycles are now considered by many aficionados to be the "Holy Grail" of vintage racing bicycles due to their beauty, workmanship, and rich racing legacy. The Masi Special replica, featured in photographs by San Diego professional photographer Ian Cummings, was built by Rob Roberson and painted by Joe Bell, two modern-day masters of their craft. Photographs by Roberson and Bell show the entire frame building process of the Masi Special replica in each stage of its construction. The gallery also features Cummings' photographs of the original 1961 Masi Special. The photographs provide a close-up look at the extraordinary skills and techniques used to hand build bicycles, skills still practiced today by the talented Roberson and Bell. To view the photographs and read Bryne's narrative about the project, visit www.Speedplay.com. Speedplay, Inc. designs and manufactures user-friendly, high performance pedal systems for road and off-road cyclists. To learn more about Speedplay pedals, call 858/453.4707 or visit Speedplay.com.